He was of course correct. Readily accessible now is the “greater sway” of persuasive men, contemporary leaders with great followings, who have denounced the reality of an eternal place of punishment created for the entity known as Satan, but also acclaimed by many as reserved for all of those whose names are not found written in the Lamb’s Book of Life. The discomfort that this topic brings is usually sufficient enough to render the believer-in-the-existence-of-hell carrier of the gospel silent about its existence. 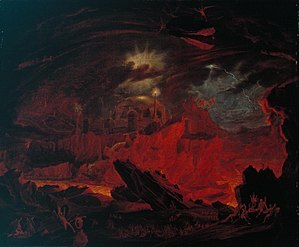 But if this place called Hell is a literal destination for everyone who has not placed their faith in the finished work of Christ, and if their sentence is one of eternity without parole, then how neglectful of responsibility would it be to stifle its reality? Could it be that there’s something more than just the awkwardness of the subject that keeps most from speaking of this place? Is it possible that the Bible doesn’t acutely tell us enough about this place to warrant a dogmatic declaration of its holocaustic flames and death-defying worms? What did the New Testament writers teach? What has been the common thought of the Church? Why many are confident there is no Biblical teaching of eternal punishment. As always, I hope much discussion comes from the readers (that’s you by the way). Can you think of a specific text in Scripture that undeniably supports Hell’s existence? It’s fallacy? This entry was posted in Hell, Theology and tagged Charles Spurgeon, Christianity, existence of hell, hell, religion, Satan. Bookmark the permalink. Thanks Michael, A sore subject for sore souls to avoid. The worst thing about hell is fire to the masses it seems. Separation from God, never sensing hope for eternity, would be the worst of hell. Being gloomy today, and not wanting to do leave the bed from depression…lasting through the eons! Knowing you rejected opportunity to never be in the eternal darkness, always seeing the simple plan of salvation…these are hell. I know some have actually counted how many times hell is mentioned through the bible..even by Jesus…what’s that famous song from the rolling stones that said the biggest trick ever by the devil is to make us believe he doesn’t really exist……I will look forward to the discussion! Jesus spoke of hell as a literal place, and that is enough reason for me. I do believe that when we look at the WHOLE picture, from creation to the end, it would make NO sense if there was NOT a heaven and hell. Looking forward to following the series . . .
Sorry… so, so sorry for the major delay Karin. I promise I haven’t been asleep all this time! 🙂 Wrapped up in some things necessary, and some things amazingly that can only be our God at work. I’m also looking forward to this study, and hope it brings me to a place of understanding. My site is a work in progress, and the footer will probably see some more changes, but it is what it is for the moment. Thank you for the encouraging words and recognition good friend. Many blessings. No need to apologize! God at work in our lives is an amazing thing not to be ignored. Am looking forward to what you discover and the lively discussion to follow. I’m really looking forward to your words on this. While on a mission trip last weekend one of the men I counseled regarding his belief said he doesn’t believe a loving God would send people to hell. I explained that God does not want that but people are given the choice. I believe in Heaven and hell. I know where I’m going and why. My heart is broken for those who don’t get it. Consider this scripture in your resources. 1 Thessalonians 1:8-9. Thank you for the advance notice…I will be eagerly watching for your posts…and hoping they will not pass by too quickly.